Lori Denman-Underhill: At Dope, we are very appreciative of the fact that you support medical cannabis and are spokespeople for the cause at events. What inspires you to go to these events, including Cannabis Cup and speak to a crowd? Why do you find it important? Alex Grey & Allyson Grey: The psychedelic sacramental revolution is dawning thanks to the return of humanity’s oldest plant ally, cannabis. Here we have a technology in a plant that can heal a great deal of suffering in this traumatized world. 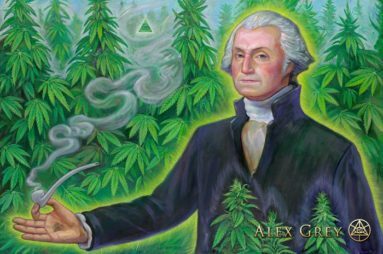 Attending Cannabis celebrations, festivals and live-painting events, we speak to the community about humanity’s ancient historic relationship with mind-expanding plant teachers. 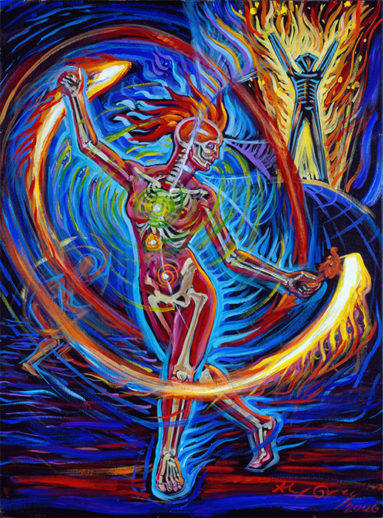 Visionary art is a natural expression of altered and mystical states of consciousness catalyzed by cannabis and psychedelics. In 2008, CoSM became an interfaith church. Traveling, speaking and sharing our truth about expanded awareness and higher consciousness harnessed to the creative path is our ministry. Lori : Can you please explain your personal journey with cannabis and using it to create art? How do you think the plant influences your work? How does it make you feel? Alex & Allyson: When we feel sad, angry or in pain and smoke cannabis, we feel better. When we feel happy and content and smoke cannabis, we feel better. 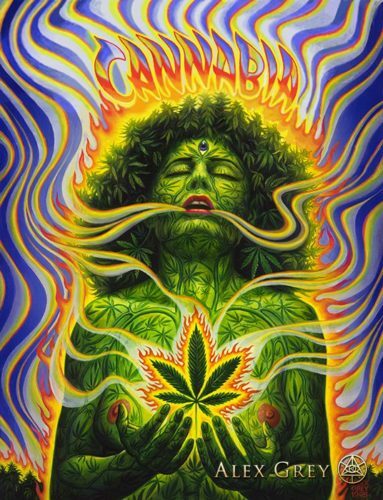 Cannabis assists creatively by easing us into a flow state. Cannabis alleviates interference from distracting superfluous thoughts by heightening connection with the soul, driving forward the creative process. 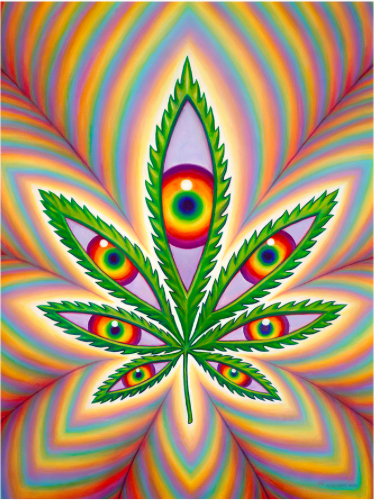 Higher Vision through cannabis suspends negative judges that keeps us from doing our best. Analyzing choices, cannabis can open us to a new perspective. We feel united with the continuous stream of sacramental human family. 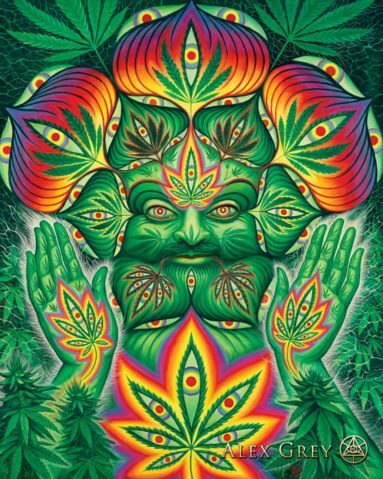 Humanity has used cannabis for over 10,000 years and every human has an internal, endo-cannabinoid system. It is a sympathetic plant that can enhance our happiness, healing and creativity. For aesthetic problem solving, cannabis catalyzes the imagination and offers visions. Cannabis leads to feeling happier and uplifted. Cannabis lubricates transitions between activities. Cannabis enhances philosophical altitude and depth. Cannabis encourages expanded empathy, compassion and altruism. When we have an aesthetic question about a painting, we sit in front of it and take our first puff of the day and see what we see or we look at a blank canvas to determine what we will paint. Lori : Do you think that as a society, the world would be better off if we legalized the plant? Why? What would it do? Please also describe if you think we as a human race would evolve? Alex & Allyson: Yes. All places on earth should legalize cannabis, at least for mature adults. Our earth would soon become a more peaceful place. Release our brothers and sisters, incarcerated for producing or distributing the sacrament. Stop demonizing people for thinking differently and uphold cognitive liberty for all. Lori : With your art work, what do you hope to achieve as a message you are sending to your viewers? It seems as if you show the connections between people’s hearts and souls as well. It’s gorgeous. Alex & Allyson: In 1974, we met in art school and have shared one studio for over forty years. Between us there are three bodies of work — Alex’s paintings and sculpture, Allyson’s paintings and sculpture and CoSM, our collaborative “social sculpture.” CoSM [stands for Chapel of Sacred Mirrors] is a radically welcoming interfaith art church in the Hudson Valley, 65 miles from New York City. At CoSM our community honors and practices art as a spiritual path. The mission of CoSM, Chapel of Sacred Mirrors is to build an enduring sanctuary of visionary art to inspire and evolve the creative spirit. Alex: My intention aligns with the Buddhist aspiration that it is possible for art to plant a seed of liberation in the mind-stream of the viewer. I want my art to help people reimagine God. 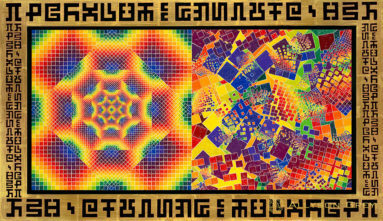 My art is a fractal representing a worldview that includes Spiritual Reality. I wish my work could suggest each living being is a unique expression of the cosmic creative force and a Sacred Mirror, making visible the core of our Divinity. Art is the skin of the soul. Allyson and I both paint the spiritual light. Together, on June 3, 1976, we saw the Universal Mind Lattice and The Jewel Net of Indra and committed our art to the same vision seen through individual filters. Allyson: After reading Be Here Now by Ram Das in 1971, I witnessed secret writing floating in ribbons through the air and hovering on the surface of all that is exists in the material world. Every “thing” in our material world has a symbolic meaning translated through each of our unique set of filters. Through LSD, I was gifted a communication worthy of portrayal in my art for a lifetime. My art is a meditation. Commitment and time are important elements in my art. The communication to which my art is committed can be essentialized in this world view:ALL can be given one of three categories chaos, order or secret language. 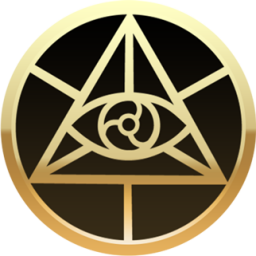 Order represents the realm of spirit in which ALL is interconnected, eternal and made of light. Chaos is the realm of matter in which ALL is inevitable entropy. Secret Writing is the symbolic language of ALL creative expression. Lori : You attend many festivals, including Burning Man. What has been your favorite festival worldwide and why? For longtime festival attendees, are there a couple your recommend, that raise your consciousness? Alex & Allyson: Burning Man is unique among festivals. This past summer was our fifth Burn [first in 2002] and it was extraordinary. What makes Burning Man special is the location, a nine mile + circle of gypsum, an ancient dried ocean bed. The ground is like a flat crust with no plants or insects, a perfect outdoor gallery for monumental interactive sculpture and architecture. The other unique feature is Burning Man's gift economy for 50,000+ people — no sales, no tribal market, no wallet needed. Only the Burning Man organization takes an admission that is plowed into funding the giant artworks, plus the formidable Burning Man infrastructure required to exist in such a harsh environment. The Burning Man organization recently purchased land for future festivals and will undoubtedly invest in the infrastructure required for activities and living year-round. Burning Man will become an evolving permanent community. 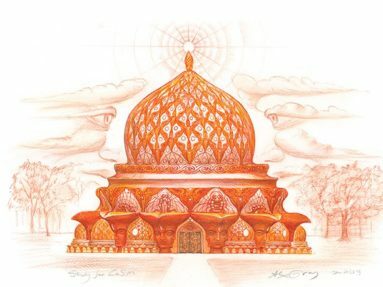 On a micro-scale, that is the plan of CoSM, a mini -retreat center and festival grounds for the global Love Tribe and a growing community that is beginning to surround the temple grounds in creation here. This past summer we were hosted at Burning Man by the Bronner REFoamation Dome — a major attraction on the playa. Truly, the best DJ’s entertain while hundreds of beautiful naked, very dry and powdery people take a scented group foaming shower, followed by rinsing, followed by a full-body coconut oil anointing. It goes on all day during the festival and is destined to be your most unforgettable shower EVER! All day, each day, we danced while live-painting our 32 foot mural, “Star Dancers.” Unforgettable. Next summer we’ve been invited once again to Symbiosis Festival where we will paint, meet & greet, and share a talk on Visionary Culture. Symbiosis, an annual festival for over ten years, is devoted to music and art. Symbiosis tries a new and interesting location almost every summer and the experienced producers pull off one of the most comfortable and entertaining festivals with reputable grace and ease. We are honored to be rejoining the Symbiosis crew to paint on stage with many of our favorite DJ’s and witness a TOTAL ECLIPSE OF THE SUN, YO!!! In your lifetime you should see a total eclipse of the sun and this coming summer it will be visible right in the good old U.S.A.!! It’s extraordinary to see ten thousand people with protective glasses looking directly at one spot in the sky for about forty minutes. Everybody everywhere will want to experience this! We’re excited. Lori : Do you think that the cannabis industry is heading in the right direction? Do you see any improvements and suggestions that you think would help, that you want to discuss? Alex & Allyson: I am very excited to be working with Higher Vision, a company that approached me with the finest cannabis oil I have ever tasted. Higher Vision Cannabis preserves the aromatic terpenes that give a unique flavor to each bud and are lost in 95% of most oils available. So when I tried Higher Visions oil, it was like tasting the future. The oil is of the highest quality medical grade purity, tested and certified. Clean clear sparkling highs with all vaping or cooking. I am honored to have my art associated with one of the greatest suppliers of cannabis products in the world. The mission of Adam Lustig, the founder of Higher Vision company, is healing the world with Cannabis. He gave me my first CBD, the most benign anti-depressant in the world. Been taking it on a daily basis for months. Loving it. I feel like CBD could be an important nutritional supplement for most humans, especially in these stressful times. When more people take care of their cannabinoid deficiency, it will be a more peaceful healthier world. Decriminalization and research is the most important thing to make a safe world where safe things can happen. People should not be afraid to do what they know harms no one and rather, improves lives. Cannabis is over-regulated. There are too many laws to control cannabis. It should be allowed to develop in whatever way the market will allow. Punishing people for using a substance for which ostensibly no harm can be discovered is unconscionable. The tide is turning, but slowly. We continue to ask everyone to support the organizations fighting the good fight, like DPA, MPP, NORML, MAPS, Erowid and pray to the great Spirit to move the hearts of the whole human family to embrace the medicine tribe. Lori : Just wanted to say, actor Larry Hagman, I interviewed him for the Daily News a long time ago, and he mentioned loving your art and doing shrooms to combat alcoholism. Do you think that if other actors and society experimented with cannabis, their minds would also awaken? Alex & Allyson: Larry Hagman was very fond of Alex and his art. We were fortunate to meet him and continue a conversation with the actor and activist, a stand for psychedelic culture when “coming out” was so clearly taboo. There are some populations that should avoid the psychedelics, like schizophrenics and borderline personalities, but Most people could benefit from the experience of psychedelics. Science has actually proven in two studies (Harvard, 1965 and Johns Hopkins, 2006) that 65% of those with a spiritual intention, who take a single psilocybin mushroom dose in a conducive set and setting (lying down with eyes closed + spiritual music) will report a full-blown mystical experience, first-hand contact with the Divine, a primary religious experience. Without exception, subjects felt that the experience was beneficial and many claimed it to be a peak experience or one of their life’s most influential experiences. An episode of profound spiritual intensity is associated with cures for addiction, obsessive-compulsive disorder, cluster headaches, depression and many other disabling afflictions. The mind-body weave now known as psychoneuroimmunology, has been gaining attention in the scientific community for over forty years. Research into mind altering plant medicines has been impeded by hysteria and lies. Science is only beginning to uncover the many life-enhancing values for which psychedelics will one day be a rich resource. Lori : How is your community going, that you have gathered at the Chapel of Sacred Mirrors? And how do you suggest that everyday people gain more spirituality in their lives? Alex & Allyson: CoSM has become a pilgrimage site for our global community. Here, we hold monthly and quarterly Celestial Celebrations, honoring all Full Moons, Equinoxes and Solstices. Just 65 miles from NYC, CoSM is a tranquil and radically welcome setting for Love Tribers coming from near and far. 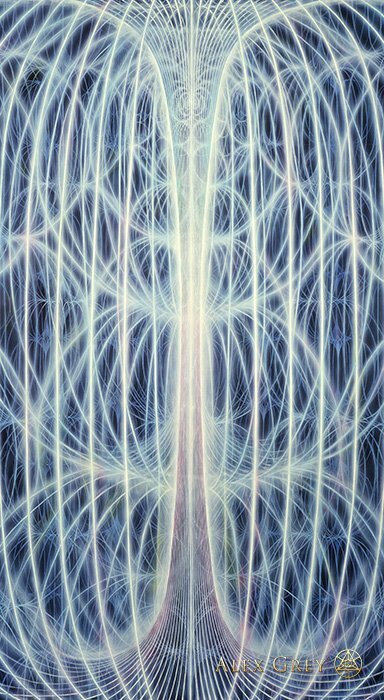 The exhibition at Entheon, expected to open Fall/Winter 2017, will be the first temple of Visionary Art at CoSM, and will share precious original art of the best loved contemporary Visionary Artists. At CoSM, art is a spiritual path. Creativity is a cosmic force, alive in each of our hands. We recommend making creativity an important part of your life and accepting your expressions as spiritual gifts to the world. Then, take your life as an artist, a musician, a dancer, writer, chef, gardener... more seriously as you practice regularly. Come to CoSM and join us for Art Church one Sunday afternoon a month where we take a journey together with art and music. Develop a creative path and value it as your spiritual life. Then join others of like mind. We see the festival and sacramental communities from around the world being some of the first signs of a true planetary culture, transcending nation-states and celebrating the creative spirit together. We believe art can be your religion. Like Love, Art ties together all the great sacred traditions because they all used creative expression or we wouldn’t know about them. It’s time to seek and reveal the underlying mystic unity of spiritual paths. The most depressing thing about religions are judgmental fundamentalist dogmas that can’t ever be proven but nevertheless lead people to justify hurting themselves or others. Dogma divides, Spirit unites. Artists can’t stand dogma. It stops creativity. So if your religion was art, Art in service of love, it couldn’t be dogmatic, except to continue to see how it could be made better to serve the spiritual evolution of the soul. Lori : Thanks for your time, Alex and Allyson. Love your work and have so many great memoriesof enjoying it all. Is there anything else you want to add? Alex & Allyson: Thank you, Dope Magazine, for offering this opportunity. Building temple grounds is the work of a community. Check out our Entheon project at cosm.org and help us get open in 2017. Creating with friends that share spiritual core values, we learn to get along and make something beautiful together. We hunger for a righteous task and group art making trains us to wage peace and look toward the light. The inevitable consequence of love is the building of temples.